Northwest is located in the hills of South Central Ohio near the confluence of the Scioto and Ohio Rivers…90 miles due south of Columbus and 90 miles east of Cincinnati. Northwest is comprised of one high school, one middle school and one elementary school located on a beautiful 100 acre campus. The district is 184 square miles which is one of the largest districts in the State when considering area. Sharon manages 22 bus routes which transport 1100 students to and from school safely every day while cumulatively traveling approximately 2800-3000 miles per day. Sharon is a Northwest alumnus having graduated in the Class of 1973. She also attended Shawnee State University where she studied Social Science. 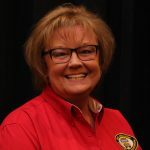 Sharon has been employed with the Northwest Local School District for nearly 18 years — 16 of which she has been actively involved with pupil transportation. Sharon has been a member of OAPT since becoming Transportation Supervisor in 2005 and has served several terms as South Region Director for the OAPT Board. Previously, she was employed by Southern Ohio Medical Center in Human Resources where she was responsible for duties including employee benefits and compensation, all while serving as the Administrative Assistant to the Vice President of Human Resources for 24 years. Sharon resides in McDermott, Ohio and is the proud mother of two adult sons, Jarrod and Austin, who have blessed her with four beautiful grandchildren, Ava Rose, Augustus (“Gus), Carter and Wyatt.